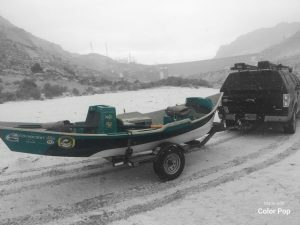 Bighorn & Wind River Fishing Report Wyoming: It is still definitely winter in Wyoming, but there is plenty of open water fishing to be had on the Bighorn, Wind and Green Rivers in western Wyoming should you have a bit of cabin fever. 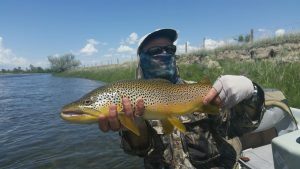 Bighorn River: Thermopolis, Wyoming Fishing Report: Fishing is good right now on the right day with the right weather. Thermopolis has had a good week of weather and it should continue through the weekend. A big change from the past few weeks with winter storms moving through. The mountains surrounding the Bighorn Basin have been receiving snow, but not excessive amounts. The Game and Fish have released fish shock results, and fish numbers do seem to be down to 1100 fish per mile. We have had a few pretty big water years and crazy conditions. 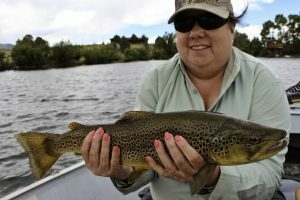 Our guides and clients have been still catching nice big trophy browns and rainbows. Most fisheries would dream of having those numbers and size of fish. Bottom line, the Bighorn River is still a classified Blue Ribbon Trout River despite lower numbers. Hot flies right now: sow bugs, midges, annelids, eggs, leeches and streamers on the right day. We have trips going out this month so please keep posted on fishing reports and conditions. 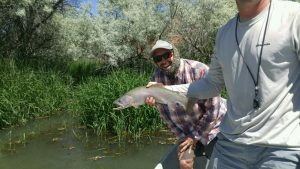 Bighorn River & Dubois Fishing Reports: The fly fishing on the Bighorn has been pretty decent this week despite unfavorable looking water. Our guides Nick and Todd have been out several days this week, and have brought quite a few nice fish to the boat. Water is off-color and visibility is limited. Water flows on the Bighorn River are currently running at 7042 cfs and Boysen Reservoir is 73% full. Inflow is up to 15,640 cfs so we are definitely seeing the beginning of peak runoff. Guide Todd is out again today, so we will have more reports coming soon. Hot flies are sow bugs and annelids right now. The fly fishing in Dubois is still fairly limited with the Wind River running big and some flooding occurring. There are a few nice lakes to fish and a few tributaries that are fishing well. Bighorn and Wind Rivers: The Bighorn River flows have dropped to summer levels this last week and fishing will be improving. There is a lot of moss in the river right now, but much of that is due to the water coming down. Fish will start to pod up again and the dry fly fishing is only going to get better. The Wind River is fishing very well right now with a lot of BIG fish eating. There is very little to no moss in the Wind River making fishing great! Our weather has been outstanding with the occasional rain shower, but we have not had a full day of rain since June. Dubois and Lander: The fly fishing in Dubois and Lander has been pretty spectacular. Our guests our catching nice browns, cutthroats, and rainbow trout. All of the rivers have come down from spring run-off and the fishing is great. We are using dry/dropper setups and finding fish eating on top and sub-surface. We love using big foam dry flies with a stonefly nymph when fishing these waters. We have been covering a lot of time on the tributaries to the Wind River and are still fishing in the lakes. The Wind River in Dubois is in prime shape right now for fly fishing. Call us today and we can set up a trip for your on any of these waters. Keep posted for more reports to come. For more photos check out our Facebook Page! 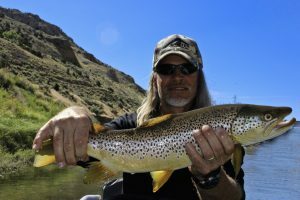 Green River: Guide, Jeff Judkins, had a stellar day on the Green River earlier this week. Our guests caught several nice browns and cutthroat trout in the 20 plus inch range. The river was flowing at 2500 cfs on Tuesday and by this weekend the river will be bumped up to 5000 cfs. This will make fishing a little tricky during the bump, but once the flows stabilize fishing will be outstanding again. Bighorn River: The river flows have stabilized on the Bighorn River. Inflow from the Wind River into Boysen Reservoir is 9818 cfs and Boysen dam is releasing 5034 cfs into the Wind River and Bighorn River (this is subject to change). Yellow Sallies have started to hatch and the river is big making for fantastic fishing. We equate big water to big fish and absolutely love guiding in these conditions. More reports to come later this week from the Bighorn River. Dubois & Lander Waters: The Wind River in Dubois and the streams in Lander are pretty much peaking making waters high and a bit off color. The fishing on the lakes (stillwater fly fishing) and the high mountain streams is the ticket right now. Fish are always to be had in the Wind River and Absaroka Mountain Ranges.